Joined in 1993 at the age of 14. Came to the club after being selected for the Avon English Schools team and participated in the Junior Girls 200 metres at Blackpool. It was soon apparent that Hannah was multi talented and she was soon a key member of the club teams. With the help of coach Graham Howell, Hannah made the most of her talents. Her range of events meant she was soon making an impact in Combined Events Competition taking a number of titles in the South West Schools and Midland Counties Championships. Following her time away at University Hannah took up 400m hurdles and rapidly improved to a high standard. 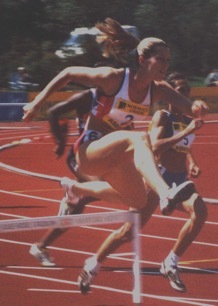 She changed her first claim status to Belgrave Harriers in 2001 and earned a Great Britain vest in an U23 representative match against France in 2001 (pictured). She married British International and Olympian Matt Douglas in 2007 and in 2009 she took silver medal in 400m Hurdles at the AAA’s Championships.